WASHINGTON — With the U.S. Senate set to vote on Brett Kavanaugh’s Supreme Court nomination Friday and Saturday, it’s still unclear whether he’ll be confirmed or defeated, although the expectation is that he’ll survive along (mostly) party lines. But one thing’s for sure: The votes will reverberate beyond this election season. Four GOP senators up for re-election in 2020 hail from states that will be top battlegrounds in the next presidential election — Sens. Susan Collins, R-Maine, Joni Ernst, R-Iowa, Cory Gardner, R-Colo., and Thom Tillis, R-N.C. And how they vote, undoubtedly, will be an issue in their re-election fights in the next cycle. Indeed, after the Denver Post reported that Gardner might be on the fence regarding Kavanaugh, the GOP senator’s office released this statement: “Sen. Gardner has been supportive of Judge Kavanaugh throughout the nomination. He had the opportunity to review the FBI report tonight. Nothing in the report changed his mind and he remains supportive of Judge Kavanaughs nomination.” Colorado, of course, is a state that Hillary Clinton won by 5 points in 2016. On the flip side, the sole Democrat up for re-election in 2020 who hails from a red state is Sen. Doug Jones, and he already announced his opposition to Kavanaugh — and so his vote will be an issue two years from now, too. Per NBC’s Frank Thorp, the U.S. Senate convenes at 9:30 am ET on Friday, setting up the key procedural-motion vote (cloture) at 10:30 am ET. That motion needs a simple majority to bring an end to the debate on the Kavanaugh nomination. 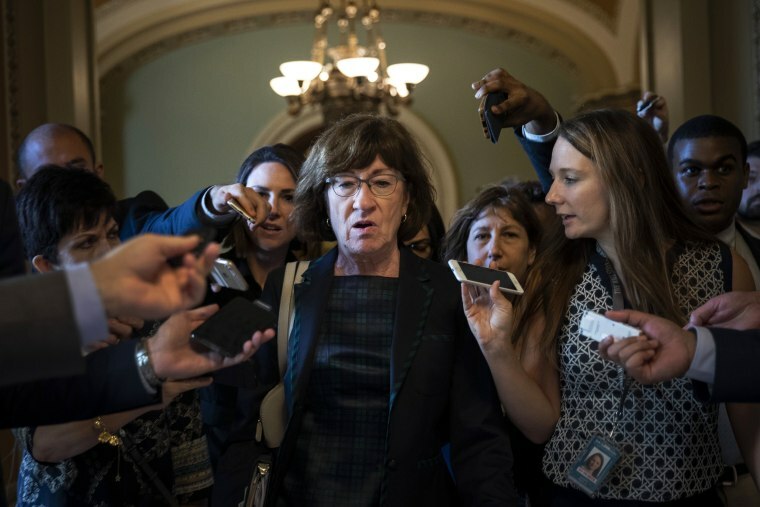 After that vote, which will last about 30 minutes, there will be up to 30 hours of debate on the nomination – equally divided between Republicans and Democrats – after which they will hold the final vote on Kavanaugh’s nomination. If all 30 hours are used, Thorp adds, that final vote would take place about 5:00 pm ET on Saturday. Kavanaugh in the Wall Street Journal: “I was very emotional last Thursday"
The good news for Kavanaugh is that he wrote the op-ed, acknowledging that his tone last Thursday was way off key. But here’s the bad news about the op-ed: It was poorly placed (why the conservative Wall Street Journal opinion pages and not, say, USA Today? ); it didn’t spell out what he wants to dial back; and it neglects to mention that he wrote those opening remarks himself — the DAY BEFORE his testimony. “Mr. Chairman, Ranking Member Feinstein, members of the committee, thank you for allowing me to make my statement. I wrote it myself yesterday afternoon and evening. No one has seen a draft, or it, except for one of my former law clerks. This is my statement,” he said. The question you have to ask yourself after reading the op-ed: Does Kavanaugh truly believe he was wrong to say the things he said at the hearing? Or does he just wish he hadn’t said them? Remember, Kavanaugh’s past partisanship (hello, Ken Starr) was always one of the most problematic parts of his resume before Christine Blasey Ford.